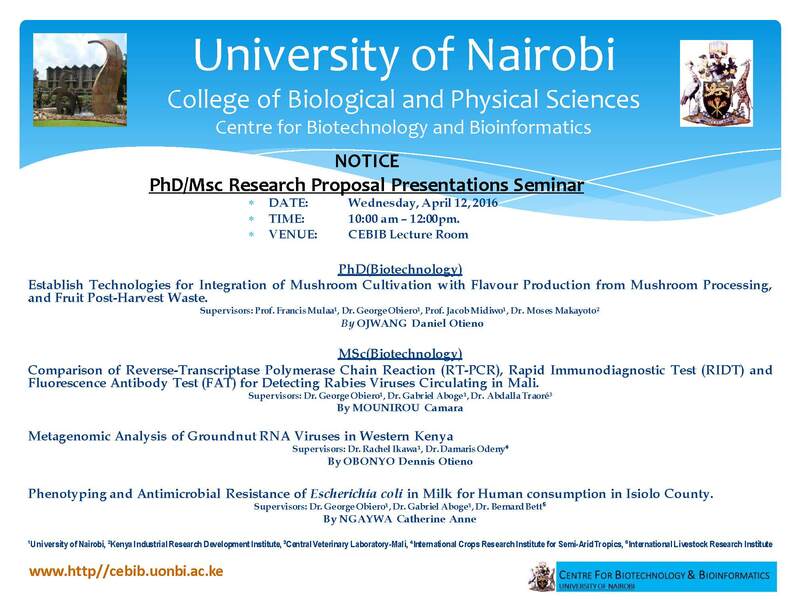 You are cordially invited to the Centre for Biotechnology and Bioinformatics for a Research Proposal Presentation Seminar engaging Masters (Year 2) and Doctoral(Year 1) students to be held on Wednesday, April 12, 2017, starting at 10.00am in CEBIB Lecture Room. The event will also involve poster presentations from Year 1, Masters students. On Wednesday February 8, 2017, distinguished guests from Earlham Institute (EI), Norwich - United Kingdom visited CEBIB. The guests, namely; Prof. Neil Hall (Director, EI), Prof. Anthony Hall (Head of Genomics, EI), and Dr. Robert Davey (Data Infrastructure Group Leader, EI) were hosted by Dr. George Obiero(Director, CEBIB), Dr. Rosaline Macharia(Lecturer, CEBIB) and Collins Owino (Graduate Assistant, CEBIB). The Centre’s weekly series of scientific journal and/or seminar presentations by postgraduate students and guest speakers kicked off its interactive sessions for the current semester on Wednesday March 29, 2017 from 1.00 – 2.00 pm. The 1-hour seminar is open to postgraduates and early career researchers. 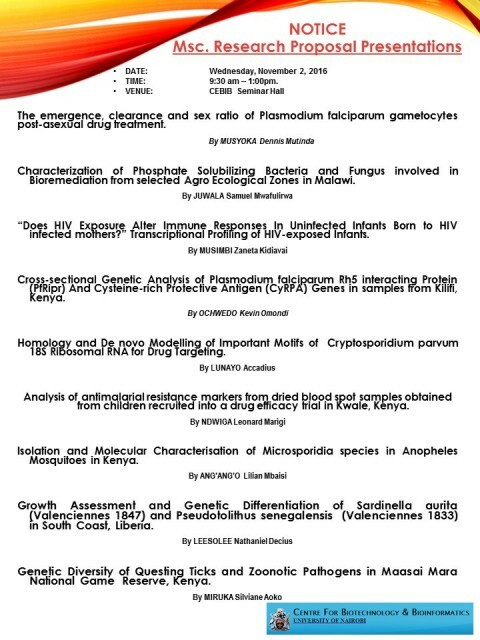 It is an enabling platform for discussion on latest trends in bioscience research published in scholarly articles and ongoing research at CEBIB. On Friday, March 24, 2017, CEBIB’s Director, Senior Technologists and Administrator joined other members of staff from the College of Biological and Physical Sciences (CBPS) who attended a half-day e-procurement sensitization meeting at the School of Physical Sciences Boardroom. Participants deliberated on implementation plan for the e-Procurement Management Information system (EPMIS) set to be piloted at college. EPMIS is envisioned to enhance efficacy in the procurement processes. CEBIB, MIB (University of Manchester, UK) and Department of Computer Science (University of Brunel, UK) explore on collaborative research. Today, December 16, 2016, Prof. Ross King, from the Manchester Institute of Biotechnology (MIB) & the School of Computer Science at the University of Manchester, UK and Dr. Larisa Soldatova from the Department of Computer Science, University of Brunel, UK; paid a courtesy call to the Director-CEBIB. The two guests were received by Dr. George Obiero, Director-CEBIB and Dr. Gabriel Aboge, Lecturer-CEBIB. CEBIB hosts Director – DELGEME, University of Science, Techniques and Technologies of Bamako, Mali. On July 4, 2016, Prof. Abdoulaye Djimde - Director, Developing Excellence in Leadership and Genetic training for Malaria Elimination (DELGEME) in sub-Saharan Africa, the University of Science, Techniques and Technologies of Bamako (Mali) visited CEBIB. The Director-DELGEME and his team also toured other African institutions that offer training programs in Bioinformatics. CEBIB MSc. Biotechnology student, Ms. Sharon Chepkemoi Towett, participated in UNESCO‐Merck Africa Research Summit held on 28th - 29th November, 2016 at Capital Hotel, Addis Ababa, Ethiopia. The second UNESCO‐Merck Africa Research Summit 2016 was organised by Merck, the world’s oldest pharmaceutical and Chemical company. Trypanolytic factor from non-vector haematophagous Insects. Upcoming Trypanolytic factor from non-vector haematophagous Insects.